A lot of people new to competitive swimming don’t realize that there are different types of pools which are actually different lengths that your swimmers compete in. To the average person a yard and a meter are about the same thing…to a swimmer they are most definitely not the same thing when it comes to their times. It is important to know which type of pool your kids are swimming in so you will have realistic expectations and comparisons of your swimmers times. There is nothing worse for a swimmer than to feel like they had a great swim only to look at the scoreboard and see their time is slow…not realizing they are swimming a meter pool instead of yards. Short Course Yards: One length is 25 yards long. This is what you will typically see in most age group, high school, and regular season college meets (at least in the United States). You will sometimes see it abbreviated as SCY. Short Course Meters: One length is 25 meters. Meters are slightly longer than yards so you will see slower times in these pools. Often its difficult to spot these pools, because they really aren’t longer enough to see the difference…but there are 2 dead give aways to watch out for as a swim parent. 1. Irritated swimmers who know they felt like they swam fast, but get frustrated when they see their times. You’ll start to hear them grumble and complain, asking their coaches and parents if this is a meter pool. 2. In the heat sheets it will say in the event line “50 Meter Freestyle” instead of yards (this is easy to miss if you don’t keep an eye out for it). These pools pop up every now and again…it’s just a matter of what the facility happened to have built. You’ll sometimes see the abbreviation SCM to reference short course meters. Long Course Meters: One length equals 50 meters. This is what you see in the Olympics. It is also what USA and some YMCA swimmers swim in during the summer. On the other hand most rec teams still compete in short course pools in the summer. 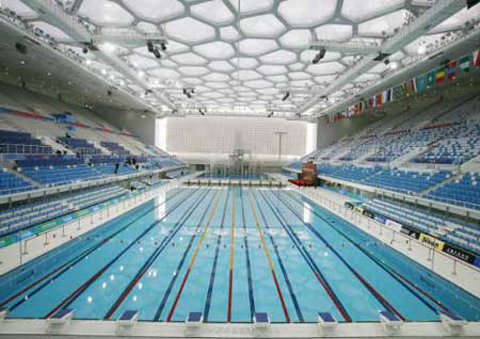 You can’t miss these long course pools, they are of course roughly double the length of a short course pool. Again these times will be slower compared to yard pools. You’ll often see the abbreviation LCM when taking about this type of pool. Times can be converted so you can get an idea of how your swimmer is doing meters versus yards. There are conversion cards you can buy at swim shops…or google it and there are lots of free conversion calculators out there that take into account stroke, long course or short course, gender, and event distance. Here is one for example. The math for this stuff is a little complicated. But if you ever want to do a very rough estimate in your head at a meet where your kid is in a meter pool….take their best short course yard seed time and add 5 seconds per 50 yards/meters swum and that will estimate a converted meter pool time. Granted, that is just a very rough estimate. (Don’t let my oldest son read this, he’d roll his eyes at me for over simplifying it…but as a mom who isn’t the one swimming…I say close enough). Want to learn more about pools? Read What Makes a Pool Fast? If you are in the United States yards is still preferable to meters. USA meets (in Fall & Winter), YMCA meets, High School meets, and college meets are typically held in short course yard pools. Ideally, if you are building a pool, the best way to go is a pool that can be used for both short course yards and long course meters. Long Course meter pools are always in high demand in the summer because USA swimming conducts their summer meets in this format. Getting lane time for practices in a long course pool is always challenging. The least desirable pools are short course meters. That is great news! I know that yards vs meters makes a big difference, because each lap can add up 1-2 yards! It is like you were training harder without even knowing it, that will help you in the ironman!